Welcome to our free banjo lessons online and instruction page. My name is Ross Nickerson. For those of you who are not familiar with me I am the author of The Banjo Encyclopedia, Bluegrass Banjo from A to Z as well as over 20 other Books and DVDs designed to help students learn how to play bluegrass banjo. My plan is to design a blog dedicated to touching on the many aspects of bluegrass banjo playing to help you create good practice habits and learn correct 5 string bluegrass banjo technique. The banjo lessons blog’s goal is to provide practical advice to help you establish your practice priorities and maintain a steady progress banjo practicingregiment as you learn to play bluegrass banjo. I’ve been teaching banjo for many years and I feel my experience has taught me many ways to help you avoid common errors and obstacles in learning to play this fun but sometimes challenging musical instrument. 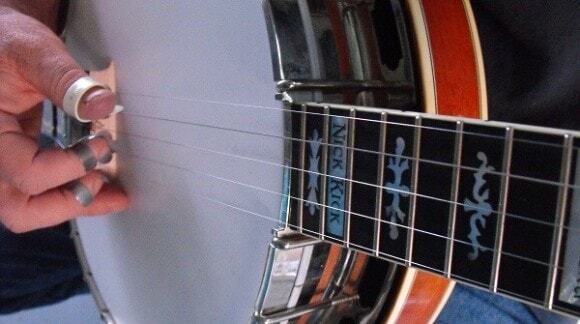 On my Banjo Lessons Blog, I’ll be posting bluegrass banjo lessons tips and advice, some videos and sound clips along with resources to help keep you moving forward. Some of the subjects I will write about and explore will be learning banjo from the beginning, like tuning, how to put the picks on, changing strings, adding a strap, tightening a banjo head, how to position your hands when playing the banjo and more banjo basics. Next we’ll delve into learning banjo picking patterns or “rolls”, how to count and learn banjo timing, how to mix up your banjo rolls and play in good rhythm. The next thing we’ll touch on is the fretting hand and how to develop skill and flexibility. The left hand or “fretting hand” if you are a lefty is a very important part of playing banjo that often gets overlooked. I’ll instruct you on one of the crucial elements to learn to play 5 string banjo which is to make the best use of your practice time and create good habits in your banjo playing. One of my articles will offer tips on how to build a foundation in learning Earl Scruggs style and how to develop the essential Earl Scruggs techniques. I will also touch on the other key banjo styles which are called the melodic or “Keith” style and single string or “Reno” style. We’ll spend time on learning chords on the banjo and learning to play backup on banjo too. I’ll offer some tips on improvising, playing banjo in different keys, learning to play familiar melodies on a bluegrass banjo and more advanced banjo techniques.